Ethan was given a bento set, a pair of gloves, a hair net and a goodie bag upon arrival. We were given several minutes of Japanese language lessons by the Chef before we start on bento making. Darling helping Ethan with the gloves during the Japanese language lesson. The chef then demonstrated the steps to make those bentos and the kids followed suit. One of the staffs assisted Ethan in the beginning but he insisted to make his own bento without help. The kids did 3 bento altogether. Ethan arranging his completed bento for judging as the top 5 best looking bento set will win a mystery gift. Ethan’s completed bento – The Sakae frog, a pink bunny and a car with Mr. Octopus as the driver! The chef went around looking at the kids’ bento and declared Ethan’s as one of the top FIVE! Yeay! The chef presented the mystery gift to the five kids. The prize – Coinbox. Ethan loves this cutey coinbox a lot! Chawanmushi with sharkfin and ginkgo. At the end of the day, the mascot made its appearance and the kids charged into it like torpedoes! Ethan oh Ethan… tak dapat hug from in front, hug backside pun jadi-lah! Literally was laughing out, his bento was so cute!!! Haha kesian him hugging froggie backside.. well it is indeed a good family activities!!! I also wan learn bento leh!!! Looks fun, how much does it costs for such event ? Nice! See the one ur dahling made… Nice or not? Can get him to make every morning for Ethan to take to school then, you just relax…go on sleeping in bed. Hehehehehehe!!!! Congratulation to little Ethan chef. This was really a very nice event for Ethan, you and your hubby. The coinbox is really cute. Tat was fun..if there is any such activities like this at Sibu, I sure will bring Ryan join too. Wow! Ethan the little chef! How come his school so fun one? Mine tarak pergi sushi making. Ada pergi bread factory & taman taman saja. Hmm. Kekeke, Ethan hugged the frog from behind happily~~ Kids are so adorable! Congrats to Ethan! This is fun! Bao Bei ah? Why you guys get to go Sakae Sushi and we went Sushi King..aiya Sakae Sushi’s food is better la. Ours was sushi making event. Yeah..we enjoyed it too. Wah must ask my daughter’s kindy to organise this kind of workshop also ler. I love bentos. Incidentally, I started doing a bento box this week (but more snacks though) for my little one’s snack time in her class. I have always liked the idea of a child + parent workshop. I shall ask Sakae here if they can run one too. LOL. Thanks for sharing, fun post! 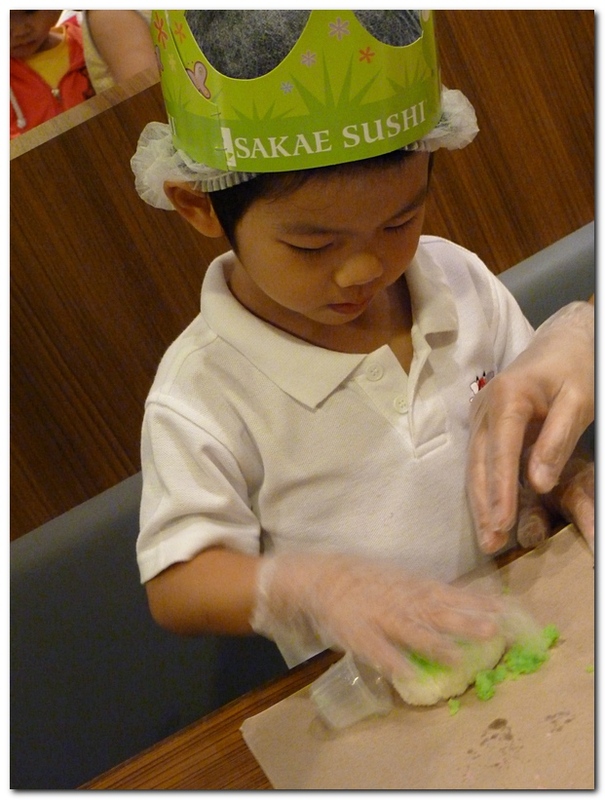 Hi, i am working at Sakae Sushi and i am collecting some fun pic about Sakae Sushi. I found your pic is fun and cute. can i share your blog on my Facebook to promoting the Kiddy Workshop ?